Meet Henrik Wessung, software developer at Adtollo since 2002. Of all the employees, he’s the one who has worked here for the longest time – 16 years. Here he tells us about the best part of the job, how the company changed over time and what he thinks will happen within software development in the future. At a time when the labour market is screaming for talented software developers and the recruitment processes feels as long as a probation period, Henrik’s story of how it was when he got into contact with Adtollo seems quite unlikely. – When I started looking for jobs in the year 2001/2002, the market was quite bad for a newly graduated software developer, he recalls. – I simply took the Yellow Pages that was used at that time and started at letter A under technology companies and began making phone calls. I came to letter C (Adtollos former company name was Chaos systems) before I was given the opportunity for an interview. At that time, Chaos systems did not actively seek for staff but was still in need of a software developer. Henrik fulfilled the interview the day after the phone call, and when the interview was completed he sat down and start working immediately. – Maybe I had no passion for document management or even the construction industry that made me search for a job here. But I must say I was lucky, because I’m very happy here. What does a regular day look like at Adtollo? When Henrik describes the software development job, he thinks that it sounds undeservedly boring. He comes to work, sits down by the computer and starts coding. Occasionally there are interruptions for meetings or colleagues who need to discuss problems and solutions. Although it may not be noticeable at first sight, it is still a varied and rewarding profession according to Henrik. – Sometimes it is all routine, but surprisingly often you’re faced with new problems that needs to be solved or a new technology that you need to learn to solve a problem. At Adtollo, software developers work with a variety of products and also some consultancy development. This means that some of the developers take part in different projects. 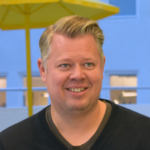 Henrik is often involved in several parallel projects, and in addition to his role as software developer, he also manages parts of the IT environment operation. The atmosphere at the office Henrik describe as open and with employees and managers working together. A relatively small company where everyone knows each other very well. At the moment Henrik is working with Congeria, a new cloud service that is linked to Chaos desktop – a document and drawing system. 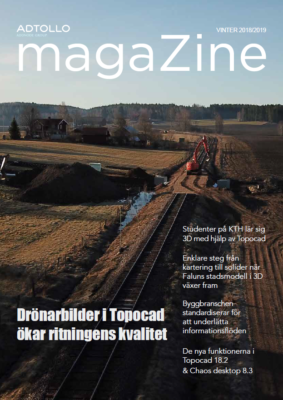 Congeria is now also linked with the CAD software Topocad, and several of the software developers are working on the product. – There are many things that are good. In my role as a software developer, it is necessary to keep up with new technologies, which means that you’re constantly developing your mind. Also, it’s a very free job where we have the opportunity to work from home which makes it easier for us as parents with our every day life, like picking up children at school and so on. Of all employees, you’re the one who has worked here for the longest time. How do you think Adtollo has changed over time? Henrik thinks for a while. Then he recounts the time when he started working, and Chaos systems was a small company located in Vreten in Solna, north of Stockholm. The servers were placed behind a drapery in the hallway. They were a bunch of guys, and the old economy lady Anita who worked once a week. The company grew and grew, then was dividid in two parts, with the software development ending up in Adtollo and the consultance business in Iterio. Moving to the newly built offices in Södermalm made Henrik really happy as he commutes from Haninge, south of Södermalm, and doen’t need to travel through the city center every day. Finally, he mentions last year when Adtollo was purchased by Addnode Group. – We are no longer just a bunch of guys, we have new products and tools, colleagues have been replaced, but I still feel that the company is quite similar to the company in Solna when I started. What do you think is the next big thing in our industry within development? – Looking at software development in the big picture, it’s happening a lot in within clods. There are several major players offering more and more complete cloud solutions that are easy to develop upon. However, as we work a lot with municipalities and the State, there are some limitations in storing data, so following new trends is not always an option. Do you have any tips for anyone who wants to work within software development? – Learn to programme and stay open minded learning new things. If you are good at programming you will probably not find it hard to find a job in the future. What do you prefer to spend your time when you do not work? – At the moment, I’m extending the house, so I spend all my time doing this and being with my family. My wife Jenny and I acctually met when we worked together as software developers at Chaos systems, but that’s a completely different story!